Click the button below to add the The Warrior's Wisdom MP3 to your wish list. Stuart Wilde says: "The Warriors Wisdom serves as a magnificent action plan whereby you learn to take a firm grip on your personal power so that firstly, you can win back control of your life; and secondly, rapidly expand your consciousness to create a commanding, transcendent being that calls to you longingly from within." The Warriors Wisdom was a dynamic seminar developed by Stuart Wilde in the 1990’s. In his witty and charismatic style, Stuart delivered assertive lectures that were inspiring and informative. They encompassed esoteric and practical instruction on how to develop a powerful sense of one’s place in a dimension of reality that is beyond the tick-tock of the everyday world. Covered in these audios are: Strength, acceptance, emotion, feelings, perception, intuition, concentration, compassion, creating energy, fear, judgement, cyberspace, opinion, contradiction, evolution of humanity, America and the world, witches, spark of God, tribal mind, charity, business, cyberspace, destiny, ego, religion, confusion, frustration, love, anger, loss, struggle, flow, institutions, infringement, freedom, intellect, identity, importance, balance, tic tock, romance, masculine, feminine, spirituality, softness, vulnerability, assertiveness, self-image, karma, out of body experience, golden age, hierarchies, etheric energy. Note from James Wild: Hope you like these inspiring and often very funny lectures from a man that defies any categorisation. They are manifestly assertive - pretty full on. For almost 20 years I traveled about with Stuart and since the mid 80's have been involved in selling his products. The Warrior's Wisdom was a seminar like no other. It was hands on and a very special event for thousands of people - including Fiona and I where we first met in Taos NM. I managed to get recordings of the lectures and this is a compilation from three seminars (USA and Denmark) - so his voice changes in some tracks. Enjoy!! The WW was just one of those seminars that goes down in history as being one of the most unusual and extraordinary personal development courses....i still think about it a lot and what it did for me in terms of "waking me up" and getting me out of the bland world I was in. I am forever grateful to Stuart and all those involved. This is a mix of lectures of the course. Unfortunately I didn't get to do it personally but the mp3 has a lot of great info from Stuie. It's so good that Quiet Earth has these available. Thanks. 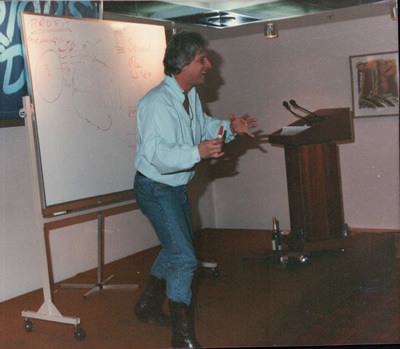 The WW seminar by Stuart Wilde was a romping metaphysical adventure - I still remember the arbans and chasing the pig. As it was such a hands on event is would be nigh impossible to capture it in an audio but the lectures here do a pretty good job.